The word ‘Yoga’ has now become well known all over the world but popular images of Yoga conjures up a hatha-yogi standing on his head or a hermit sitting in meditation in the Himalayas. The deeper psychological and pragmatic significance of Yoga is however fully understood only by very few. Teachers of hatha-yoga have popularised health benefits of Yoga while most spiritual teachers and masters have emphasized Yoga as a path for spiritual development of the individual. What is not clearly understood is that Yoga is a psychological science which can be applied for enhancing the quality of every activity of secular life. This is where the importance of the unique contributions of modern sages like Sri Aurobindo and Swami Vivekananda come in to help us understand the developmental significance of Yoga. ‘Yoga’ says Sri Aurobindo ‘is nothing but practical psychology.’ Practical for what? For the psychological and spiritual development of the human organism. Yoga is the scientific, psychological process or discipline by which the inner development of the human being is triggered and accelerated. According to Sri Aurobindo all life is a Yoga of Nature. There is a slow evolutionary process of Nature which works in the mass of humanity through the normal experiences of life. But Yoga speeds up the process through an intensive, conscious and concentrated application of the psychological energies of the human being. Before proceeding further with our discussion, we have to clarify what we mean by psychological and spiritual development. Psychological development is development of the intellectual and rational intelligence and will; the emotional, ethical and aesthetic being; and the dynamic and pragmatic faculties for action and execution. The activities of a modern business organization leads to a certain amount of psychological growth in the intellectual and emotional being and a much greater development in the dynamic and pragmatic faculties of action and execution. By spiritual development we mean two things –first, the awakening and development of that part of our being beyond the rational and emotional being and deeper than the ethical and the aesthetic. Second, a life governed by this spiritual dimension of our being and its faculties like intuition and its values like oneness, unity and harmony. The Indian concept of the triple qualities of Nature can perhaps help us to understand the inner development of the individual in an evolutionary perspective. According to ancient Indian thought, universal Nature, of which the human being is a part, is made up of three qualities. First is Tamas or inertia which is the essential quality of our physical nature. Predominance of Tamas leads to uncreative, stagnant and inefficient sloth. The second is Rajas or dynamism which is the essential quality of our emotional being and the dynamic and pragmatic faculties of action. Rajas brings energy, enthusiasm., enterprise, efficiency, productivity, outer progress and the strength to survive, succeed and prosper in a competitive world. The third is Sattwa, the essential quality of our intellectual, ethical and aesthetic being. Sattwa leads to knowledge, clarity in thought, tranquility, harmony and sensitivity to higher values like truth, beauty and goodness. Beyond sattwa lies the self-luminous perfection of the Spirit. Inner development of the individual or the community proceeds from tamasic to rajasic, rajasic to sattwic and from sattwic to spiritual consciousness. The Indian ideal of human development is tamas subjugated by rajas, rajas illumined and guided by sattwa, and sattwa opening to spiritual consciousness. All ordinary, normal experiences and activities of life lead to a certain minimum amount of unconscious or half-conscious inner development through the struggle for survival, pressure of the environment, effort towards fulfilment of some outer aims and achievements like power, knowledge, wealth, success, relationships, ‘love’ and enjoyment. In professional activities like management or engineering there is a greater, more rapid development of certain faculties of our inner being. But in all ordinary experiences of life, inner development is incidental, a more or less unconscious result which happens in the process of fulfilling the outer aims of life. In a Yogic approach this inner development is made the conscious aim and outer activities and aims merely the means for realizing this inner aim. As of now the Science of Yoga is being applied only for the inner spiritual development of the individual. But we believe the time has come for harnessing the potentials of this great science for the inner [total or holistic instead of inner?] development of the group or community such as a business organization. For a community, like an individual, has an inner dimension made of its knowledge, values, a network of human relations which generates a lot of emotional energy and a distinct psychological, ethical and aesthetic temperament. What is known as culture in modern social sciences is the expression of this inner dimension of the community. However, most communities strive only for outer economic, social and political development and not for inner development. When this outer development is pursued consciously, with a scientific, systematic and methodical approach and concentration of outer energies and resources it leads to a rapid outer development of the community. This, in the essence, is the modern science of Management. What management can do for the outer life and its resources, yoga can possibly do for the inner being of the community and its inner resources and energies. But so far no secular organization has made the attempt towards a conscious inner development of the community. The pragmatic mind of a modern manager or entrepreneur may question the need for this inner development in a secular, business organization pursuing economic objectives. There are many factors that make this inner development a necessity for the future progress of an organization. First of all it is essential for the full realisation of the integral human potential of an organization. An exclusive outer growth in terms of increasing efficiency, productivity, or diversification develops only the pragmatic mind and some part of the surface intellectual and emotional being. But it leaves a large part of the human potential in our deeper and higher layers of consciousness – like the deeper intelligence and emotions, the ethical and aesthetic mind and the spiritual intuition, that could enhance the quality of corporate life – unmanifest and untapped. The second factor is that an indefinite outer growth is not sustainable. The organization which pursues such a one-sided growth may be very successful in its outer life but inwardly it becomes gross and heavy, losing its sensitivity and openness to the deeper, finer and higher possibilities and powers of life. And at a certain stage even the outer success or development becomes unsustainable because the organization becomes a closed system, shut off to the higher forces of life. Then come all the negative laws of life like the laws of entropy, diminishing returns and diminishing satisfaction which cripple the community. The third factor is that at present entire earth and humanity is in such a condition that a purely material or quantitative growth has become unviable. Environmentalists and ecologists around the world warn that our planet can no more sustain an exclusively material and quantitative growth, that future growth has to be in a direction that doesn’t strain the ecology of the planet. And when we look at the present condition of human consciousness, it is as Sri Aurobindo points out ‘satiated, but not satisfied’; satiated with outer enjoyment and comforts but not satisfied inwardly because there is a void within. So in the future there will be a widespread seeking for some form of inner fulfilment in all sections of society. An organization that doesn’t grow inwardly cannot provide this inner fulfilment to its employees and without this inner fulfilment its workforce cannot be motivated. And finally, our Yogic approach is not exclusively inward. It aims not only at the inner development of the individual but also for a creative harnessing and channelling of the fruits of inner development for the enrichment of outer life. The following discussion is an attempt to apply the principles of Yoga to the evolution and development of a business organization. All organisms pass through a process of natural growth involving many stages of development. No organism can pass from the lowest level of development to its highest potential in a single bound. There are stages of growth. When we examine the history of modern business and management, we can identify four distinct ideals or paradigms of development, each corresponding to a stage of growth. The first one is the ideal Efficient Wealth-creator, creating more and more wealth for the shareholder and employee, with a primary emphasis on efficiency, productivity, diversification, technological progress, and market-leadership. The next higher ideal is the Customer-driven organization oriented towards quality, innovation and customer delight. In this paradigm wealth-creation and market-leadership are considered as the results and not the aim. The third and still higher ideal is a Creative and responsible corporate citizen with an emphasis on social responsibility, ecology and stakeholder value, contributing creatively to the growth of the community. In the wealth-creator paradigm social contribution is an incidental by-product. But in the corporate citizen paradigm, the organization makes a conscious and creative effort for the development of the community by sharing some of its resources and expertise with the community. The corporate citizen is not narrowly focused on shareholder value but aspires and strives to add value to the entire stakeholder community which includes not only shareholders but also employees, suppliers, customers and the ecological and social environment of which it is a part. The other ideal of organizational development is the human development paradigm, conveyed crisply in an old advertisement of Tata Steel, ‘We make human growth opportunities. We also make steel’. In this paradigm, the organization is viewed as a field of human development and the task of management is to provide ‘growth opportunities’ for employees and channel this growth for realizing business goals of the organization. But here also there are three possibilities depending on our vision of human development and type of growth encouraged by the organization. First is the modern managerial mindset which views the human being as a set of useful professional knowledge and skills and therefore aims at creating an organizational culture which encourages the individual to constantly upgrade and hone his professional skill and contribute to the bottom line of the organisation. The second higher ideal is the vision of the ancient Hellenic culture of Greece which viewed the human being as an embodied mind with intellectual, ethical, pragmatic and aesthetic faculties, growing by developing harmoniously all these faculties and helping the community to grow by expressing all his powers in every activity of individual and communal life. The third ideal is the Indian spiritual concept which views the human being as an embodied spirit or soul evolving towards its spiritual destiny and perfection in divine consciousness. The yogic approach to human development opts for a synthesis of the Hellenic and Indian vision, with the managerial ideal of skills development only as part of a more integral development process. The yogic vision looks at man as a four fold being with a body, life, mind and soul, evolving towards his spiritual destiny through a process of inner development, at the same time helping the community to grow by expressing his inner growth in every activity of his outer life. And finally, the yogic approach will add another higher stage or ideal, the planetary citizen paradigms. At this stage the organization rises beyond social responsibility towards an evolutionary responsibility to planet earth or universal Nature. It aspires to become a conscious instrument of Nature for the fulfilment of the evolutionary destiny of humanity and the planet as a whole. These five paradigms correspond to different stages in the evolution of a business organization. Most business organizations stop at the wealth-creation, customer-driven or skill-development stage of human development paradigm. A few of them, for example Body Shop, have perhaps entered the corporate-citizen stage. Thus, the spiritual or yogic paradigm of human development and the planetary citizen belong to the future. The strategic goal of the yogic paradigm is to navigate the corporate ship through all five stages in a conscious, organic, self-directed evolutionary process, integrating the lower stages with that of the higher. When this is done successfully, it leads to the integral inner and outer development of the organization. Let us move on to the more practical aspects of this development. Each organization has to begin from where it is at present, then move on progressively towards its highest potential through various stages. A major problem or task here is to choose the perspective appropriate to the stage of development at which the organization is placed. This is a difficult leadership choice which should not be done according to the personal fancies and preferences of the leader. It requires insight into the evolutionary status of the organization and its existing capacities and resources. There are two factors to be considered in making this choice. As discussed earlier, no organization can pass from a state of tamasic inertia to sattwic or spiritual consciousness in a single bound without passing through the stage of rajas. The second factor is known in Indian thought as Dharma or swadharma of the organization. Each human activity has its own intrinsic law and natural dharma, and Swadharma, or social functions and cultural values that arise from this inborn nature. Thus, an organization too has its swadharma as part of an organ of the society with its own dharma. A business organization being part of the economic life of a community cannot therefore neglect its economic function. Similarly each stage of the individual or collective evolution has its own dharma. The leader of an organization may be spiritually inclined and opt for the spiritual ideal of Yoga. But the organization [his employees?] may be in a state of tamas and not ready or prepared to realize the higher ideal. In such a situation if the leader tries to force the higher ideal on the organization [them?] it will lead to miserable failure. However, if the organization is passing through the rajasic phase of evolution or has passed beyond it and is ready for the higher ideal and if the leader in his enthusiasm for the spiritual ideal, becomes world-weary and neglects to fulfil the bottom-line economic and cultural goals belonging to the wealth creation and customer service paradigms, then also there will be failure. So for effective implementation of the Yogic paradigm mere spiritual idealism is not enough; it must be balanced by a clear understanding of the pragmatic realities of the organization. Here, leadership task involves two crucial decisions. First, the leader should have a clear understanding of the organisation’s present evolutionary stage and the dharma of that stage, for each level of evolution has its own truth, law and aim, its dharma. The leader should thus choose a matching paradigm to fulfil this dharma. He or she should at the same time know when and how to make the transition to the next higher stage with a new paradigm. Wallowing contentedly in a particular stage of evolution leads not only to stagnation but disintegration of the organization for change and progress is a fundamental law of life. Anything that doesn’t progress slips down and disintegrates. But trying to jump prematurely into a higher paradigm when the organization is not ready for it also leads to failure and disappointment. However, this doesn’t mean that when the organization is in the lower stages it should concentrate exclusively on the dharma of that stage and ignore the higher stages altogether. A visionary organization has to prepare itself for the future in the present. So it can initiate projects or ideas belonging to the higher stages on an experimental basis at corporate planning and strategy levels or in executive development programmes. The ideal path of development is to keep the highest spiritual aims in the background as a source of inspiration and slowly, gradually and consciously pass from one stage to the other with an emphasis or priority attention on fulfilling the dharma of the stage the organization is passing through at that particular period of time. Let us now examine how the principles we have discussed so far can be applied in navigating the organization through the different stages and their corresponding paradigms. All the stages of evolution can, to a certain extent, be initiated and pursued simultaneously except perhaps the last stage of the planetary paradigm for this concept can be pursued only by a global organization which has fulfilled the dharma of all previous stages of evolution. But the aim or dharma of all the stages cannot be simultaneously fulfilled. An organization can proceed decisively to a higher stage or paradigm only when it has acquired a certain mastery in fulfilling the dharma of the lower stage or paradigm. When the dharma of a higher stage or paradigm is fulfilled in the right way without neglecting the dharma of the lower stage, and integrating the lower with the higher, it leads to a better realization of the dharma of the lower stage. Wealth-creation, customer-driven and human development stages and their corresponding paradigms can be initiated and pursued simultaneously because they are closely interrelated. Efficiency, productivity, innovation, quality and customer satisfaction are the source of wealth-creation. And, as the emerging perceptions in management have discovered, the deep source of all these values and aims or in other words, the realising power behind all these values is the human being and his knowledge, skill, capabilities, attitudes and values. But there is also an interlocking hierarchy in this interrelation. Let us first examine this interdependence between the wealth-creation and customer driven paradigms. An organization lacking in efficiency and productively cannot produce quality goods or satisfy the customer or be innovative. So a solid foundation in efficiency and productivity is essential to realize the customer-driven paradigm. At the same time, as all the latest research in business show, when an organization moves on decisively to the customer driven-paradigm and begins to realize its aims like quality, customer delight and innovation it leads to better wealth-creation. This principle of mutual interaction between the higher and lower stages applies to all other higher stages of organizational development. But an important factor to be kept in mind is that wealth-creation and customer-driven paradigms form the fundamental dharma of business. Efficiency, productivity, quality, customer service, innovation and wealth-creation are the basic dharma of a business organization. So it is not advisable for a business organization to move decisively to higher paradigms before fulfilling its basic dharma. An organization has to exist, survive, sustain and establish itself and have something to give before it can realize the ideals belonging to the higher paradigms. In the present intensely competitive business environment any organization weak in these basic dharmas of wealth-creation and customer service cannot possibly survive. Similarly as the organization progresses towards higher stages of evolution and their corresponding paradigms the same law and principle holds good. As we have indicated earlier, human development paradigms can be pursued simultaneously with wealth-creation and customer-driven paradigms. If an organization is sincerely committed to a humanistic or spiritual vision, this paradigm acquires added importance. The organization’s vision and values of human development and corresponding attitudes to human beings have to be carefully cultivated and established in the individual and corporate consciousness from the very beginning of its evolution. But the practical emphasis or the precise nature of development will vary depending on the stage of evolution. For example in the first two stages of evolution, emphasis has to be on developing the skills, capabilities, values and attitudes required for realizing the aims of wealth-creation and customer driven paradigms. When the skills and capabilities of the organization have attained a certain level of mastery in realizing the aims of these two paradigms on a sustained basis, then the Human Resources Development emphasis can be broadened to include development of higher faculties like the intellectual, ethical, aesthetic, intuitive or spiritual. The organization is now well poised for a more focused and concentrated inner development. Wealth-creation and customer-driven stages, when they are successfully traversed, would have helped the organization to reach the highest levels of rajasic development and also a certain amount of sattwic growth in the intellectual and ethical dimensions. To realize the aims of wealth-creation and customer-driven paradigms intellectual capabilities in technology, management and innovation are required. And an ethical element is involved in dedicated service to the customer. Thus we can see that even while the organization is pursuing outer growth there is an unconscious inner development. But in the yogic approach this inner development has to be made fully conscious by making all outer activities and aims a means for inner development. To do this HRD managers have to find answers to the following question – what are the inner faculties that come into play during the various outer activities of the organization at different levels of the corporate hierarchy – and implement them in the corporate life. How are these faculties to be developed to their utmost limits and actualised? What are the standards and values to be upheld in these activities? At this point, the organization may enter more decisively into the corporate citizen stage. In the earlier levels, the organization could have initiated some ecological and social projects on an experimental basis to prepare itself for the future. But now the organization is more or less prepared to launch and position itself centrally into its next level. And the corporate citizen paradigm when properly planned and executed can help the organization in realizing the higher aims of human development. If the organization wants to realize higher levels of human development beyond professional self-actualisation to a more integral development of its human potential, it must be able to provide its employees with the necessary education, training opportunities and experience needed for development at all levels – professional, intellectual, emotional, ethical, social, cultural, aesthetic and spiritual. Here social and ecological projects can help in the ethical development of employees by helping them to actualise some of their moral needs for social contribution and service. But ethics or ethical behaviour is only one aspect of the higher evolution of the human being. There are mental, emotional, moral, aesthetic levels and a vaster intuitive-spiritual level of human consciousness which are at present either totally unmanifest or very much underdeveloped in the collective consciousness of business, or for that matter, in modern humanity as a whole. Even the ethical element emerging in business in the form business ethics or “values” or ecological and social responsibility is still at a rudimentary stage. So an organization that wants to realise the higher ideals of human development must strive to develop these dimensions of human potential. This means an inner progress of the organization. And this inner progress has to be channelled in the outer life of the organization, leading to a better quality of corporate life. The central task here is to create the awareness, systems and methods by which every work or activity becomes a means of inner development for the individual, the result of which is again channelled back into the work or activity to enhance performance and quality of the work or activity. Let us examine briefly how this can be done at various inner and outer levels of the organization. At the mental level the organization has to strive for a constantly expanding horizons of knowledge, not only in the field of knowledge directly related to business, but also for a deeper and broader understanding of business, their values and aims, in the light of an integral vision of human and planetary evolution. This vision has to be imparted to all employees of the organization at every level and made the basis of decisions and actions. Some new ideas emerging in modern management have taken the first tentative steps in this direction. Let us look at two examples – first, the concept of “learning organization” by Peter Senge and secondly, the “developmental organization” conceived by Du Pont. The concept of the learning organization goes beyond accumulating information. ‘Learning’ says Peter Senge ‘has very little to do with taking in information. Most fundamentally learning is about enhancing capacity. Learning is about creating and building the capacity to create that which you couldn’t previously create.’ The new capacity a business organization has to acquire to progress rapidly into the future is the ability to materialise a philosophic, psychological, ethical, aesthetic or spiritual idea in its outer life. For it is towards these higher levels of growth that future evolution of humanity is heading. In the second example, we see a business organization making a sincere and creative attempt to give shape to philosophical and psychological ideas such as – ‘Being able to utilise every effort to improve performance as an opportunity to develop myself and vice versa’; and ‘Being able to bring to every decision-making process a total perspective that holds within it a reflection of all the critical elements which make up the whole of business and the nested system of which it is a part’. At the emotional level, the organization has to create a social and cultural system leading to a rich, healthy and refined emotional life for its employees. For this to happen prevailing corporate social values, which encourage only contractual, impersonal and professional relations, have to be replaced by new values encouraging deep, intimate, personal relations, not only among employees but also with customers and suppliers. In this context some new ideas emerging in modern management, like ‘work-life balance’ are very helpful. For most of us, the family is a haven of emotional support and every attempt towards a harmonious integration of work-life with family life helps in the emotional development of the individual. But some other new ideas and practices, for example, employability, downsizing and the hire-and-fire culture are not very helpful to the emotional development of an organization. For the emotional growth of an average human being requires building a stable community with enduring relationships, based on deep mutual understanding and trust. But some of these new practices that treat human beings as transient and disposable ‘resources’ or knowledge-and-skill engines are not conducive for building a stable community group. So for the inner development of an organization we may have to return to some of the earlier organizational values like job-security, loyalty, and some form of patronage. But we have to discover the deeper truth of these values at a higher level. However, a stable community and enduring personal relationships alone are not sufficient for the higher emotional or psychological development of the individual or group. We have to awaken the ethical and aesthetic faculties of human consciousness and their refining influence in the mind and heart of the individual and group. Ethical development and refinement comes through an inner and outer culture which emphasizes on the values of sharing, giving, empathy and compassion; self-control, especially over negative feelings like jealousy, anger and greed; and dedication to a self-transcending cause. But for a genuine and complete ethical development these values have to be lived not only in behaviour and action but also in thought and feelings. These are the principles of moral development more or less well recognized but what is not equally recognized is the power of art and aesthetics on the emotional and ethical development of the individual and group. An aesthetic culture emphasising on beauty and harmony in thought, feeling, sensation, action, gestures or behaviour has a deep refining influence on emotions, which in turn has a positive impact on the ethical development of the individual. In fact most of the great ancient cultures of the world, such as ancient Greece, were more or less aware of the importance of the aesthetic sense in human development. But this aesthetic ideal was confined mainly to art, poetry, music, and culture; it was not applied to development of the material, economic and social life of a group. So this is an idea a modern organization, rising on the ascending curve of evolution, can experiment with for much benefit to the group. To begin with, the aesthetic ideal may be introduced in the education and training of employees and as well as in organizing its material environment. Finally, the spiritual development of the group. To implement this ideal into corporate life, some important conditions involving leadership decisions have to be fulfilled. First condition is that leaders of the organization should have a clear understanding of spirituality and yoga and their life-transforming potential. For Yoga or spirituality is, in the popular mind, very much associated with life-denying asceticism and the traditional cross-legged, closed-eye ‘Meditation’. But the leadership or management which wants to enter into this paradigm should understand that spirituality can be practiced and expressed in and through every activity of life and when done in the right way, can lead to the enrichment and transformation of corporate life as a whole. In other words spirituality or spiritual life should not be viewed as something distinct or separate from the mundane or secular life; it should be viewed as part of life, and as the highest potential of human life. Awakening of the spiritual dimension means the awakening and realisation of the highest human potential in every activity of human life. This holistic vision of spirituality has to be established in the collective consciousness of the organization and expressed through every activity of corporate life. This integral spiritual vision requires a path different from most traditional paths with an emphasis on meditation. The lonely cross-legged, closed-eye Meditation is not the only path for spiritual growth. This traditional meditative practice is a powerful technique of Yoga and for those who know how to meditate in the right way it can bring about a rapid inner growth. But very few people have the capacity or the temperament for an exclusive, or even a predominantly, meditative path. Thus, for most of us who work in organizations [outside world? ], the best path to spiritual growth is not ‘Meditation’ but through Work and Relationships. This doesn’t mean discarding Meditation. No spiritual seeker can afford to ignore this great art of internalisation discovered by ancient eastern yogis. Recent studies and research around the world have validated the effectiveness of meditation not only for spiritual growth but also for more mundane things like one’s inner and outer well-being or creativity. So every employee in an organization should be encouraged to learn this art of going inward. But any approach that lays excessive, one-sided emphasis on traditional methods of meditation tends to ignore other forms of meditation or spiritual practices which can be practiced in the course of work and action, in dynamic contact with all life. And such practices have a greater relevance for inner development of corporate life than cross-legged, closed-eyes meditation. So for implementing yogic or spiritual paradigm, the central idea an organization has to explore comprehensively is how to achieve the psychological and spiritual growth of the group through work and relationship. The management has to explore all possible means to implement this idea in thought and action, and through research and experimentation. There are many methods and disciplines available in ancient as well as modern spiritual teachings, for example the Karma Yoga of the Gita, mindfulness of the Buddhist Yoga, Choiceless Awareness of J.Krishnamurthy, or Integral Yoga of Sri Aurobindo and The Mother. The management has to arrive at some form of practical synthesis of any of these methods, and which can be applied for the inner development of the group. The second condition is that management and leadership should make a sincere attempt to live these spiritual values in their personal lives, for spirituality is communicated and transmitted more effectively through the silent living example of a person than through words and ideas. This principle is now well recognized even at mundane levels of management as expressed in the characteristic Yankee smartness of the American management aphorism, ‘Walk the Talk’. But ‘walking the talk’ becomes much more important in a spiritual or yogic paradigm. The leaders of the organization have to become living example of wisdom, compassion and inner strength to their associates for these are the fundamental values of spirituality, representing the triple aspect of the Divine. As we have already indicated, some emerging ideas and practices like downsizing and the hire-and-fire culture is out of sync with a compassionate spiritual culture. In a spiritual, or even in a genuinely humane culture, people should not be treated as “resources” to be dispensed with at the slightest competitive pressure from the environment, internal problems, unacceptable behaviour or performance. People have to be viewed as growing sparks of the sacred and divine essence of life and helped to grow towards their highest potential. Pressures from the external environment should be tackled by harnessing the collective wisdom of the group and opening our consciousness to the supreme Wisdom of Divine consciousness. Downsizing should be resorted to only when it becomes absolutely unavoidable. And even then employees who are asked to leave should be helped to find alternative employment. Similarly, problems and difficulties of employees, in their behaviour or performance, have to be treated with compassion and understanding. Management has to make a sincere attempt to understand the root cause of any problem causing unacceptable behaviour and the erring employee helped to overcome his or her difficulties. This doesn’t mean soft-pedalling with an obstinate or frequent wrong-doer. Someone who is stubbornly unwilling to progress due to ill-will, laziness or obstinate attachment to his or her weakness may have to be asked to leave the organization for tolerating such obstinately negative attitudes will set a bad example and be harmful to the higher evolution of the organization. Similarly with the ego of people. In spiritual approach, the ego is not part of the sacred or divine essence of man; it is a superficial formation at the surface levels of our being and a part of our lower nature made of ignorance and darkness. This is the reason why all spiritual traditions of the world look upon the ego as the arch enemy of moral and spiritual development. So in a spiritual culture all excessive display of the ego, especially in the form of arrogance and pride, will not be treated kindly, but firmly or even severely when it disturbs the peace and harmony of the group. So when we counsel a compassionate approach to human development, it should not be mistaken as weak saintliness incapable of firmness. It must be kind, tolerant, patient and understanding to those making a sincere effort to progress in the path of higher evolution but firm and tough, even ruthless if need be, to all those who are obstinately unwilling to grow or are hostile to higher values. However, the pragmatic mind of a manager may ask – can such a predominantly “soft” culture survive in our present aggressively competitive business environment. We admit that initially there may be a certain amount of loss or blunting of the competitive edge against more ruthless and aggressive organizations. There may be loss of market leadership but at this higher stage of evolution, market leadership is no longer the aim. We are here striving for a better quality of corporate life by actualising the higher and inner dimensions of the organization. Being number one or two in market share is not necessary to pursue this higher growth. If we can satisfy the customer, produce quality goods at reasonable prices by bench-marking within prevailing standards then we will have sufficient market share to survive and prosper as an organization. And at the stage of growth the organisation is presently considering, it would have established and mastered the skills required for realizing the bottom-line goals of earlier stages. However, there is a deeper truth. An Idea is a force. A moral or spiritual idea lived in action releases a great moral and spiritual force, which in the long run, has material results at the bottom-line. This higher moral or spiritual growth also opens the consciousness of the organization to corresponding cosmic forces in the inner realms of the world, and which will sustain the organization through all difficulties, helping it to triumph in the end, provided the organization remains faithful to the higher values. So whatever the initial loss in competitive edge caused by the higher growth or values, is, in the long-term, more than compensated by the higher forces released into the organization. We have so far been discussing the inner development of the organization, let us take a look at the corresponding outer progress as well. The inner development can be pursued simultaneously or accompanied by a corresponding outer progress from corporate citizen to planetary citizen. This outer progress of the organization is pursued by a progressive integration with the larger whole. The first of this larger whole is the stakeholder system. A business organization is part of the stakeholder community made up of employees, shareholders, customers, suppliers and the social environment. So in this first stage of integration, the organization should not be exclusively or even predominantly focused on shareholder value. It should consider itself part of the stakeholder family and live for the well-being and progress of this larger family. The second whole is the economy. Since a business organization is part of the economic system, the economic aims of the organization should never be neglected or ignored in the pursuit of higher aims or ideals. The organization should consider itself part of the larger economic system and do something more and direct to the well-being and progress of this economic whole than the incidental contribution in the form of producing goods or paying taxes. The third whole is the Nation. Even if the organization is a global multinational, individual units of the organization is part of a nation. Cultural values of a Nation have important practical implications for the motivation and creativity of employees so integrating with the national whole requires a sensitive understanding of the unique values and genius of the native culture. And beyond nation is the whole of humanity and our planet earth. This highest stage of integration requires understanding of the evolutionary destiny of humanity and our planet and the specific mission of business in fulfilling this destiny. This outer progress of the organization, from the corporate to planetary citizen, depends on how creatively and consciously the organization is able to integrate itself with the larger wholes, as it grows in size from the provincial, national to a global and multinational conglomerate. In future, the main values that will lead to a successful integration with the larger whole are Partnership and Participation – partnership with other parts of the whole and conscious participation in the life of the larger whole. The guiding principle for partnership is knowing how to complement other parts in a mutually beneficial relationship, including the competitor. The guiding principle for participation is creative contribution to the well-being, evolution and progress of the larger whole. 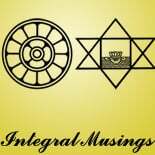 This entry was posted on October 1, 2012 by integralmusings in Integral Management.